Frequency and signal strength display! Exposure limit calculation according to DIN/VDE 0848! 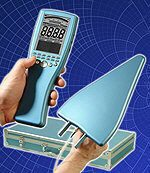 The SPECTRAN HF-2025E is the ultimate RF measurement device for the novice at an unbeatable price! Several included accessories (LogPer antenna, special battery, charger and transportcase) and the extended functionality (like DECT analysis!) particularly allow the novice PROFESSIONAL measurements at an affordable price. Option power detector for REALTIME power measurements. This NEW Revision3 offers a lower noise level and a optional REAL TIME power detector.